Once upon a time, I got tired of being like every other lemming in a box. I took the MSF and bought a bike. Several years, struggles, and a few bikes later I arrived at the dream bike, the 899. I've never modded a bike until now because I plan to keep this one for a while. As a mundane office worker, friends and family have said that riding a superbike daily is crazy, but their idea of insanity is my greatest solace. My goal is to make the Pani suit me and my riding because it's my only bike. Commute to work; take the long way home. Explore the path less traveled; see the unseen. Hammer the track; become a better overall rider. Here's how she stands now, I'll update with pictures and explanations of the build and the journey as times comes. She's named after the Italian/Roman Goddess of wisdom, war, and art; Minerva. jkeown, smcf, XCLR8TN and 6 others like this. My plans are to keep her livable for the daily grind. The bike is already far above what I can bring out on the track. Instead of focusing on making the bike go faster, I need to become a faster and safer rider. 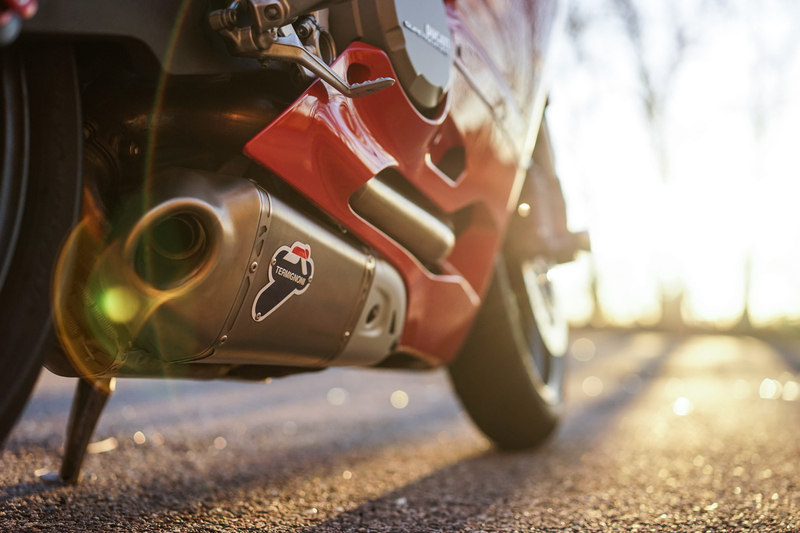 When I dove deeper into motorcycle sub-culture, I realized modding the motorcycle itself isn't the biggest struggle. It's what you need to do to continue riding that creates the most compromises. I want to emphasize that also. MustangWolf, ilconseglieri, XCLR8TN and 1 others like this. Last edited by Panzer; 11-14-2015 at 08:05 AM. Reason: It's more fun if you don't know the exact build too. It sounds like you are going about this in the right way but beware! An Italian Goddess is very powerful and persuasive. She will cry out for carbon fiber(her favorite), rearsets and a tailtidy. She won't stop till she gets what she wants. New graphics are also on her list. Minerva will gently whisper her wants and desires in your sleep till you succumb to her needs. You will try and resist but they always get their way. I know! vyruz, smcf, Hypnodic01 and 2 others like this. Mind you, I only rode it stock for about an hour. There was a subtle change in the power delivery. I think it's the revised map more than anything, it makes the bike run a bit leaner and smoothens some of the roughness out. The sound however, was so loud it was hurting my ears and setting off car alarms as I rode by on my way to work. I had to source the dB killers by asking the previous owner of the bike and exhaust for the dB killers. It retained the deeper grunt quality (slightly higher pitch) and no longer echos through city streets. After a few days of riding I noticed that when I was wearing anything BUT my leathers I would slider off the slippery paint. The force of my grips was not enough to prevent my family joules from creating an equal and opposite reaction with the gas tank. I held onto the bars quite tightly to prevent this from happening putting unnecessary strain on my wrists and palms. The top of the grips show some loosening of the material but it works so I keep them. Unless I want tiny rubber floor mats. While I was doing online shopping I wanted to make the bike look a little more bling. I felt the yellow on the LighTech logo matched the springs and ordered them. It ended up being a little short for my tastes though and the magnesium metal gets chilly when I'm riding in 40 degree weather. 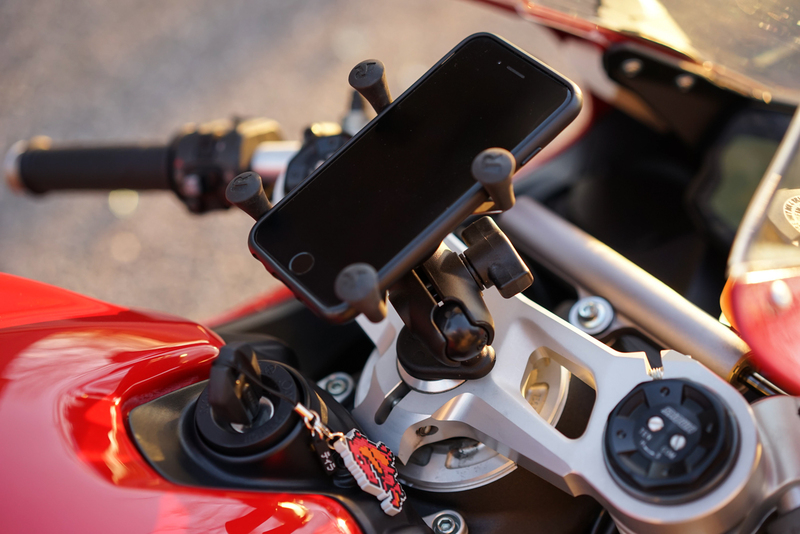 I kept on using my GPS by listening to Google Maps tell me where to go in my ear -- it wasn't something I was going to put up with for long so I got the Ram X mount because other people trusted it, so I would too with my iPhone. I followed a guide as listed here, not exactly as my shop did not have the same parts, but they worked regardless and it holds strong. vyruz, craiger527 and ahvengeance like this. Next on the list is rider gear so I can be eligible for track days and schooling. My fender currently holds my disc brake lock. Minerva doesn't like holding the extra weight because she's a spoiled girl. She wants me to hold all of my cargo and all of her things when we go out. She convinced me she needs that tail tidy ASAP. I'm sure there will be many suggestions forthcoming from members but if i could just make one of my own, maybe look at getting rad guards. Rowan and rybo like this. Since comfort/control is priority one, may I suggest changing grips to the ProGrip 717? They are cheap (Ducati Omaha have them at $16 - link), and make an immediate difference comfort-wise. They are slightly thicker and way grippier, so you can maintain a light grip without feeling slippy on the bars. 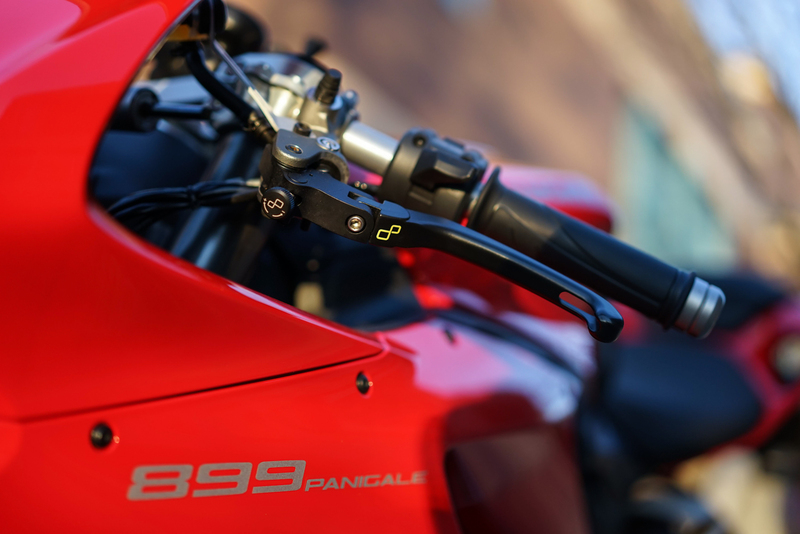 The black-red ProGrip 717 comes stock with the 1199 Superleggera. craiger527 and Panzer like this. That's what I've done so far. She's a track and road bike like yours. But I am trying not to take her to many track days now as I'm saving up for a cheap R6 track beater so I can learn how to go faster on the track, and not stress about a huge repair bill. Track Riding has changed my outlook on motorbikes, and these 899's are just so darn expensive to fix after a 'get off'. If you break the tank it's only $2,500. 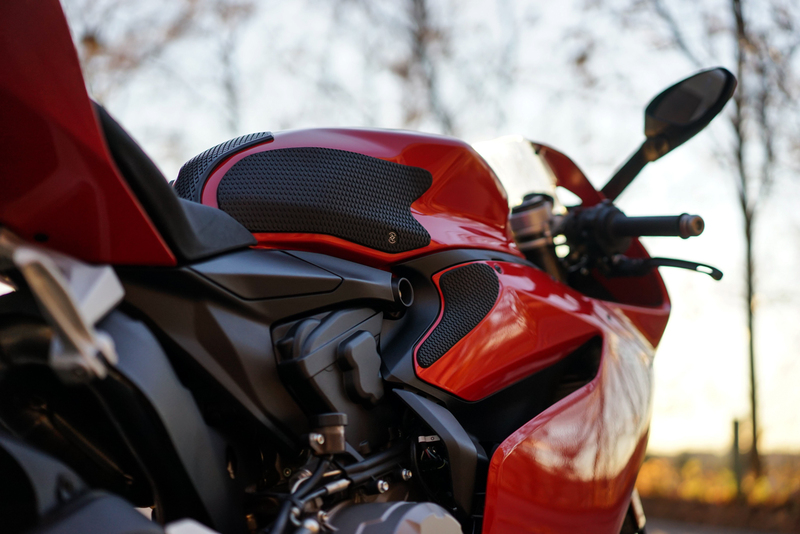 Good thing we have steel tanks instead of plastic ones, plastic costs $3,500 from Ducati. Makes me wonder what we're paying for sometimes. Thanks for the heads up. My very first post on the forum was about the 3M guard actually, good reminder about bringing that back. Haha.